Each summer the Bates Dance Festival selects artists to come to BDF as part of the Emerging Choreographers Program. Started in 1993, the program was initiated to provide gifted US-based choreographers, who are beginning to establish themselves in the field of contemporary dance, with access to the resources of the Bates Dance Festival’s international community of peers. 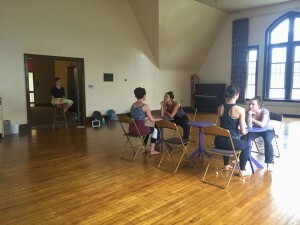 Our first choreographer in residence this summer is Ali Kenner Brodsky. Ali’s here on campus for three weeks, working on an evening-length work titled PARt. Based in southeastern Massachusetts, Ali is the director of ali kenner brodsky & co, a company “known for emotionally driven and gesturally rich pieces.” Four of Ali’s dancers have joined her on campus for this residency. Ali’s focusing her residency on PARt, an all female quintet. Though she’s been working on the piece for a number of years, this time at BDF is allowing her to dive back into the material. Ali describes this process as “throwing all the pieces in the air to see where they settle.” Ali and her dancers have the opportunity to take classes with the Young Dancers Workshop in the mornings, and rehearse in the afternoons. Later this week they will open up their rehearsal to the Young Dancers and BDF community. Their work will culminate in a showing of the third section of the piece titled, parT III as part of the DanceNOW concert in Schaeffer Theatre on July 9. Check back on the blog over the next few weeks for updates on their progress! This post was written by Chava Lansky. Chava is the BDF Social Media Intern for the 2016 summer.